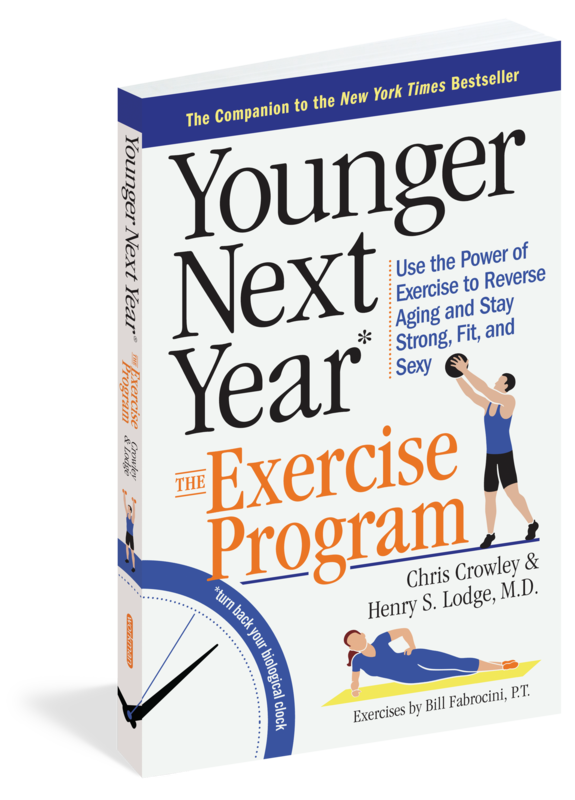 The definitive exercise book that the one-million-plus readers of the Younger Next Year® series have been waiting for—and the exercise book that takes the intimidation out of starting a workout routine. Based on the science that shows how we can turn back our biological clocks by a combination of aerobics and strength fitness, this is the guide that not only shows you how to start an exercise regimen, but provides the motivation and know-how to keep it going for life. Just as important: Here is the guide that shows the right way to exercise. Here is the revolutionary 10-minute warm-up (critical for maintaining ankle, shoulder, and hip mobility). The five amazing things aerobic exercise will do for your body, and finding the method that works for you. How to get fit better and quicker with intervals. The importance of “whole-body” strength training and “rebooting the core.” Plus, the Twenty-Five Sacred Exercises that will be the foundation for your strength-training routine for life. Now, a women’s edition. 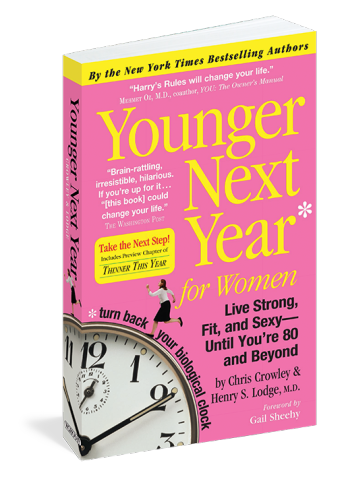 A New York Times bestseller with 115,000 copies in print in hardcover, Younger Next Year is the breakthrough program for women to turn back their biological clocks and live healthier, more active lives into their 80s and beyond. You’re serious about exercise and eating better. Now It’s time to write things down. It could make all the difference. People are serious now. They’re going to the gym and changing their diets. Hundreds of thousands of people are working on turning back their biological clocks, doing the exercise that can put off up to 70% of the typical decay associated with aging and eliminate 50% of the illnesses that afflict people as they get older. 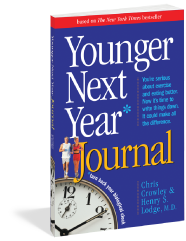 Now, to make that promise even easier to achieve, comes the Younger Next Year Journal. This is a needed recordkeeper for every trip to the gym, or better yet, bike vacation or ski trip. Beginning with a short introduction to working out the Younger Next Year way?how to use a heart rate monitor, why keeping a journal is important, how to look at exercise as your new job?here is a 224-page fill-in book with prompts that help you keep meticulous track of your workouts, your heart rate, your diet, how you feel, how you?ve reached out to others, and more. 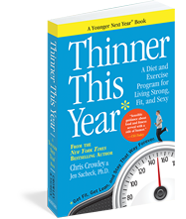 Chris Crowley, the memorable patient and coauthor of Younger Next Year, partners with Jen Sacheck, a nutritionist and exercise physiologist from Tufts University, and in lively, alternating chapters they spell out a weight–loss plan that will have readers lose up to 25 pounds in the first six months–and keep it off for life. The message is straightforward and based on the most up–to–date nutritional science. Exercise, the authors emphasize, is the great flywheel of weight loss. 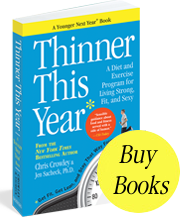 And whereas Younger Next Year told you why to exercise six days a week–Thinner This Year tells you how to eat and how to exercise, from the best aerobic workouts to a lifetime supply of 25 whole–body strength exercises–the “Sacred 25”that will build muscle, protect joints, and add mobility. At some point in their lives, 80% of Americans will seek expert help for back pain. It’s an epidemic, with a cost to society in medical expenses and lost productivity that is steeper than heart disease. But remember the 80% figure—that’s the astonishing cure rate at Dr. Jeremy James’s Aspen Club Back Institute. A Doctor of Chiropractic who took that path because of his own severe injury-induced back pain, he has developed a revolutionary behavioral/whole-body approach to help sufferers heal—and often eliminate—back pain forever. 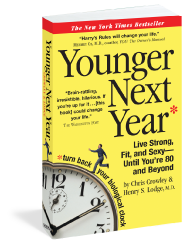 Co-written with Chris Crowley, The Younger Next Year Back Book follows the alternating chapter format of the #1 New York Times bestselling Younger Next Year and other books in the series. And just as millions of readers positively changed their lives following Harry’s Rules in Younger Next Year, the millions of back pain sufferers can find relief following Jeremy’s rules, including Stop Doing Dumb Stuff, Be Still So You Can Heal, and Stand Tall for the Long Haul. He explains the workings of the spine and muscles, and then why back pain is almost never a disease, per se, but the result of behavior. 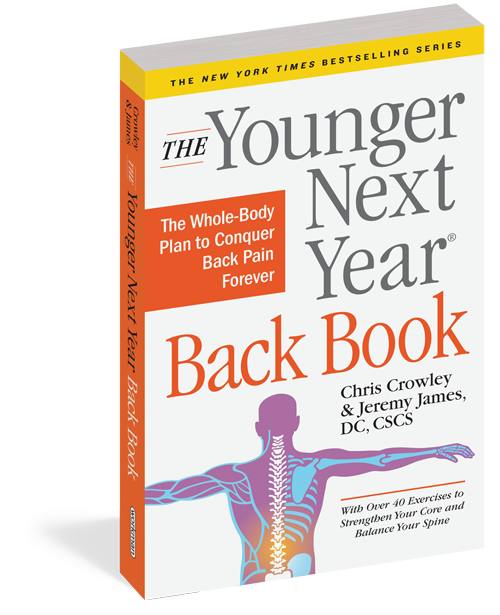 He then shows how to change our behavior, find a neutral spine, and begin a regimen of simple exercises—with step-by-step two-color illustrations—to realign our core to virtually eliminate back pain forever. Chris Crowley, in his been-there-done-that-and-you-can-too-damnit! voice, provides all the motivation and patient perspective we need.